This second edition of the IRF Environment Newsletter is very timely. IRF has been particularly active in the past months with the launch of the new IRF Environment Committee, the organization of a first Study Day on green public procurement and technology advancements in the road sector, and the participation at key international events and expert groups. Strengthening our collaboration with relevant partners is also on the way. This second edition of the newsletter dedicated to Environment will give you an outline of the latest developments in our sector and of IRF activities in this domain. The upcoming IRF Environment & Climate Change Bulletin - published in two volumes - will further enhance and complete this overview. Do not hesitate to share with us your views, suggestions and knowledge! We look forward to your active involvement and to your enhanced collaboration with IRF. 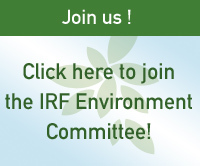 After successfully achieving the goals set in the initial three year mandate, the IRF Environment Working Group has been given new direction and impulse. Part of this is the reorganization of the Working Group into the new “Environment Committee” articulated in four sub-committees. The launch meeting was hosted in Brussels in September back to back with IRF Environment Study Day. VicRoads, the Victoria Road Authority, has recently released its sustainability rating tool for road construction projects, named INVEST (Integrated VicRoads Environmental Sustainability Tool). Similar to Greenroads, INVEST is a certification program that distinguishes road construction projects based on the extent to which they incorporate sustainable choices. IRF and 200 other selected participants were convened last October in Copenhagen for the Global Green Growth Forum. As a result of the strategy session on Green Public Procurement (GPP) – to which IRF actively contributed - stakeholders present at the forum formally tabled interest in an international initiative to promote green public procurement that could be coordinated by IISD. IRF will lead the initiative's work in the road infrastructure sector. Proceedings of IRF Environment Study Day now available! Hosted at POLIS in Brussels on 20th September, the IRF Environment Study Day on “Green Public Procurement & Technology Advancements in the Road Sector” gathered key stakeholders and institutional organizations. The event was particularly valued as it was the first specifically addressing GPP in the road sector. Despite the significant part that roads play in public expenditure, there has been very little attention and debate on what institutional, market and capacity barriers need to be removed in the sector to achieve even greater scaling up of GPP in the immediate term. Learn more by checking out the full proceedings now available on our website! The second session of the UNECE Expert Group on Climate Change Impacts and Adaptation for international transport networks was held on 8 November 2011 in Geneva. The meeting was an opportunity for IRF to highlight the work of its members on adaptation. 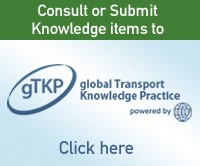 One of the tasks of the group is to produce a final report with policy-oriented recommendations and proposals to improve the adaptability of international transport networks to climate change. The European Commission is moving forward with the planned revision of the air policy. The public consultation launched in June 2011 on the air quality policy has just closed. Divided into two parts – a short questionnaire for the general public and a longer section for experts and practitioners – the questionnaire aims at harvesting input on how best to improve European air quality policy. The Commission aims at having a comprehensive review of EU's air policy by 2013 at the latest.